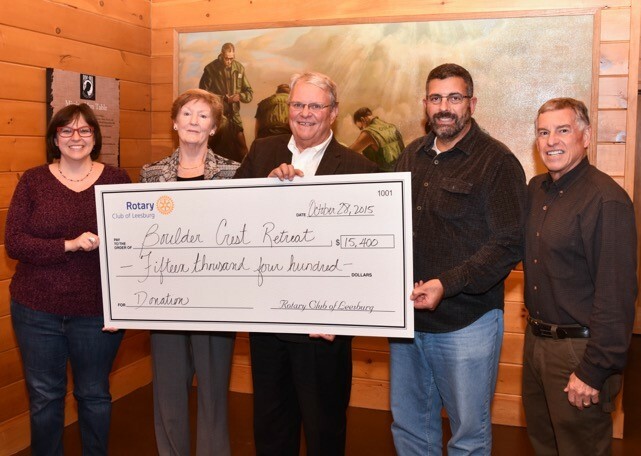 The Rotary Club of Leesburg Foundation was pleased to present a check for $15,400 to Boulder Crest Retreat - the first privately-funded, rural wellness center serving our nation's combat veterans and their families. Boulder Crest, located in Northern Virginia, was the beneficiary of the successful Second Annual Toast to Our Heroes Wine Tasting Event, held at Murray Hill in beautiful Loudoun County. The club members are long-time friends of this retreat, a unique, 501(c)3 non-profit organization. Other support includes meal preparation by Rotarians for retreat participants several weekends each year. Rotarians Valerie, Dee, John and Ron were instrumental in making this wine event a success, as was Ken Falke, Sara Fehrer and other Boulder Creek Staff. Special thanks go to Altria, the major sponsor.